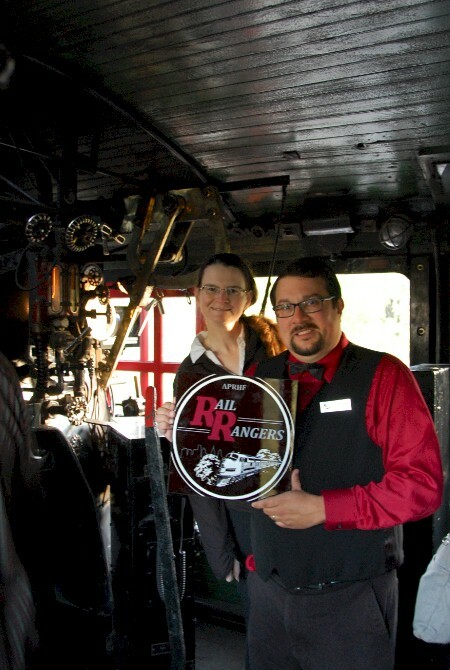 The APRHF Rail Rangers program kicked off its on-board narration activites in October 2015; here the logo is seen aboard private car "Cedar Rapids". 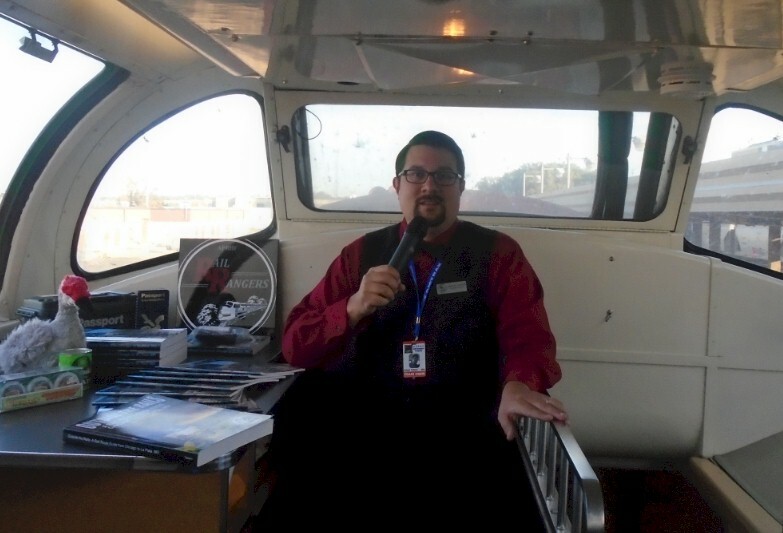 The APRHF Rail Rangers presented their first two on-board interpretive programs during private rail car excursions earlier this month. 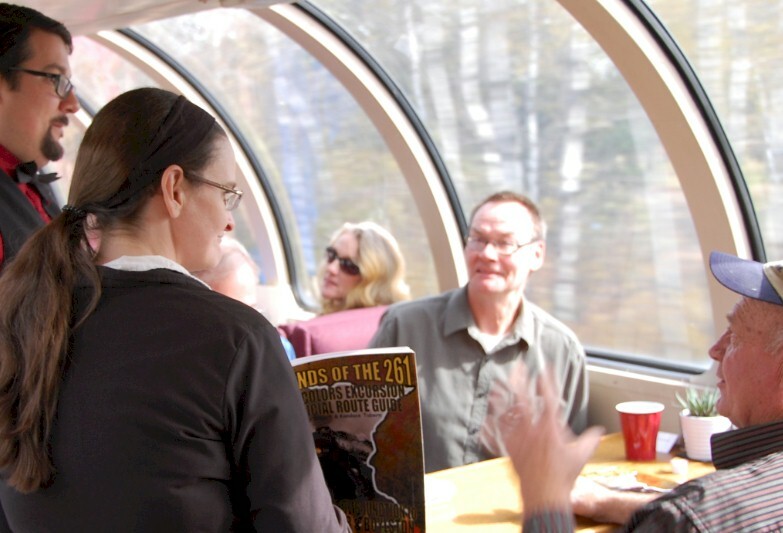 On Sunday, October 4th, 2015, APRHF Rail Rangers volunteers were onboard a trip organized by the “Zephyr Route” group, using an ex-Great Northern full-length dome car to see the sites between St. Paul Union Depot, Minnesota and Chicago Union Station, Illinois. 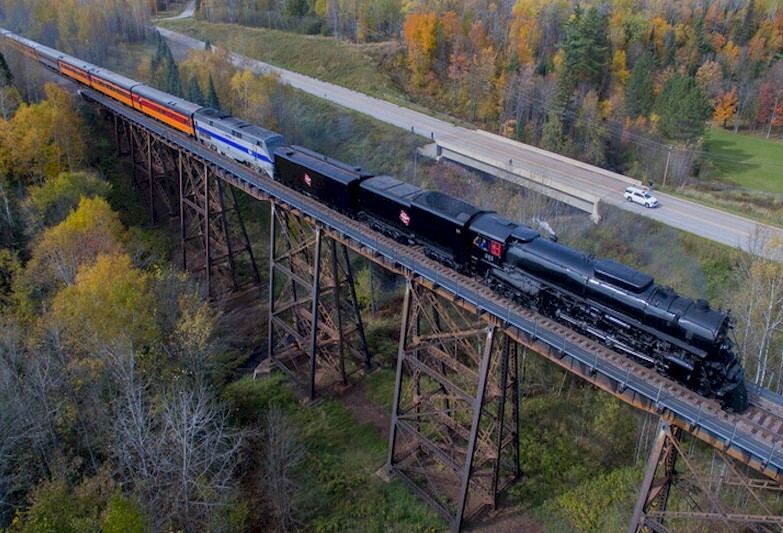 On Saturday, October 10th, 2015, APRHF Rail Rangers volunteers were also onboard a trip organized by the “Friends of the 261” using an ex-Milwaukee Road steam locomotive and a string of private rail cars that operated between Minneapolis Junction, Minnesota and Boylston Wye, Wisconsin (just south of the Twin Ports of Superior/Duluth). 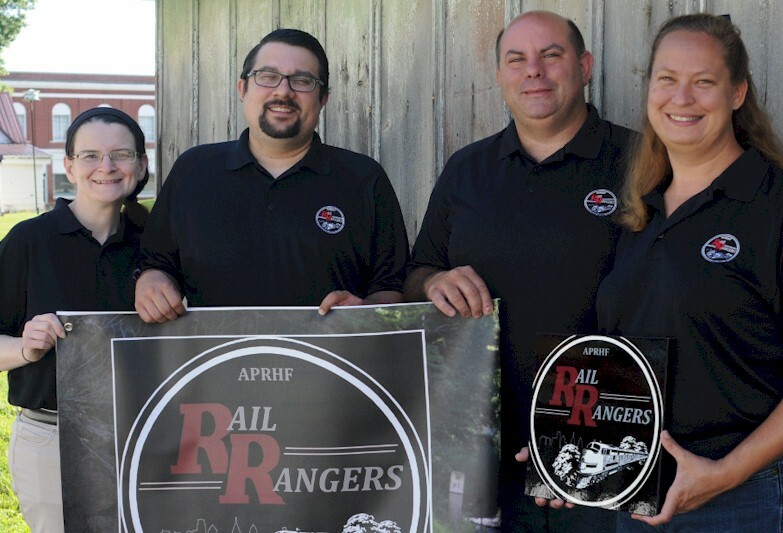 The APRHF Rail Rangers program was founded in July 2015, as a direct affiliate of the American Passenger Rail Heritage Foundation in La Plata, Missouri. The program is headed by Executive Director/Chicago Coordinator Robert Tabern, La Plata Coordinator/APRHF President Bob Cox, Chicago Assistant Coordinator Kandace Tabern, and La Plata Assistant Coordinator Amy Cox. 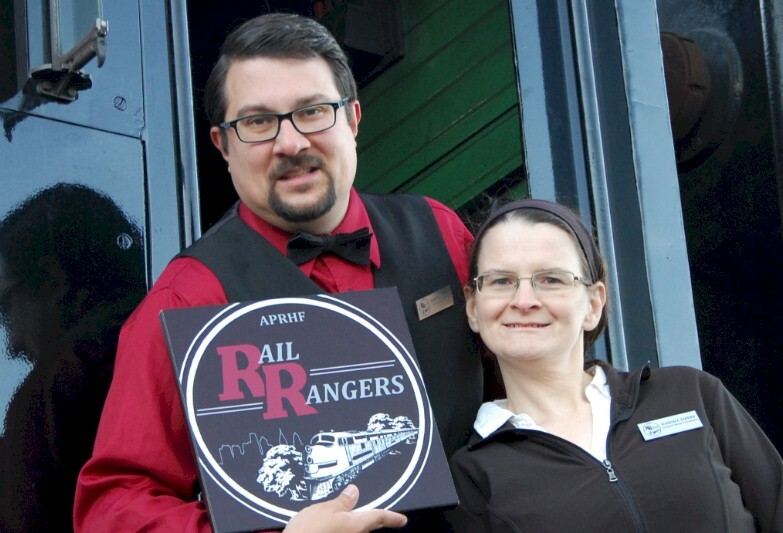 The goals of the APRHF Rail Rangers program are to provide interpretive programs, narration, route guide sheets or books, maps, and other service to passengers on private rail excursions or charters. Whenever children are onboard an excursion, APRHF Rail Rangers offers a brand new ‘Junior Rail Rangers’ program where youngsters and teens can learn more about the route by partaking in special activities geared toward their age levels. Those who purchase and complete the corresponding activity book are eligible to earn a Junior Rail Rangers patch, sticker, and custom-made gold activity badge. The APRHF Rail Rangers also spread the mission of their group, and the APRHF in general, by attending various rail-related outreach events in the Midwestern United States. One of the private car owners/operators who agreed to work with the APRHF Rail Rangers from the start of the program this summer is Mike Abernethy of Saint Charles, Illinois. 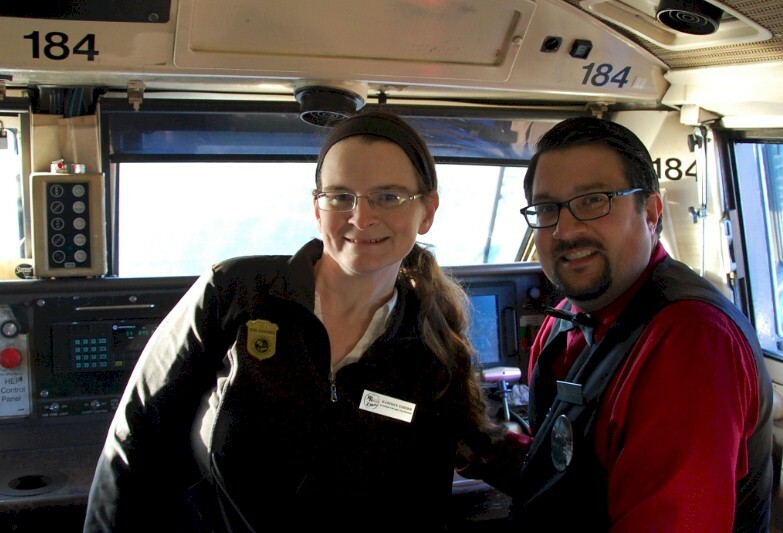 Abernethy formed a company called “Zephyr Route”, which organizes rail excursions all across the country, with a focus on the Midwest day and weekend trips. 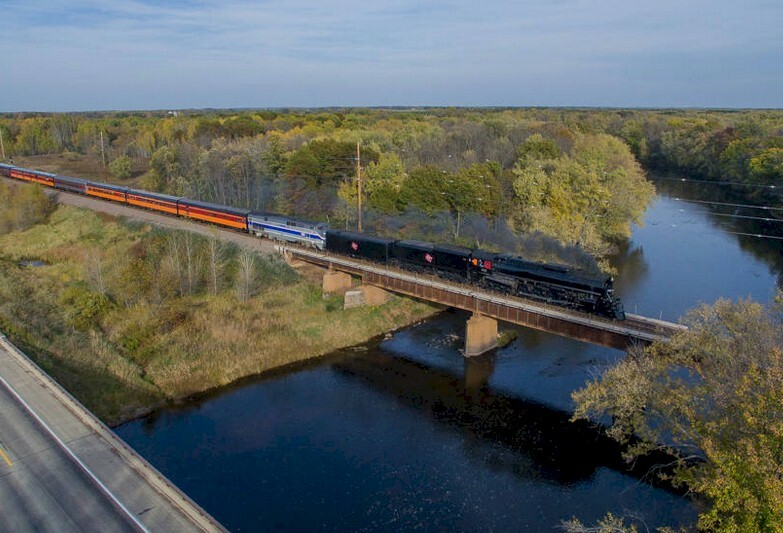 “Zephyr Route” has done weekend trips from Chicago Union Station to such places as Saint Louis, Denver, Galesburg, Quincy, Hannibal, and the Twin Cities. 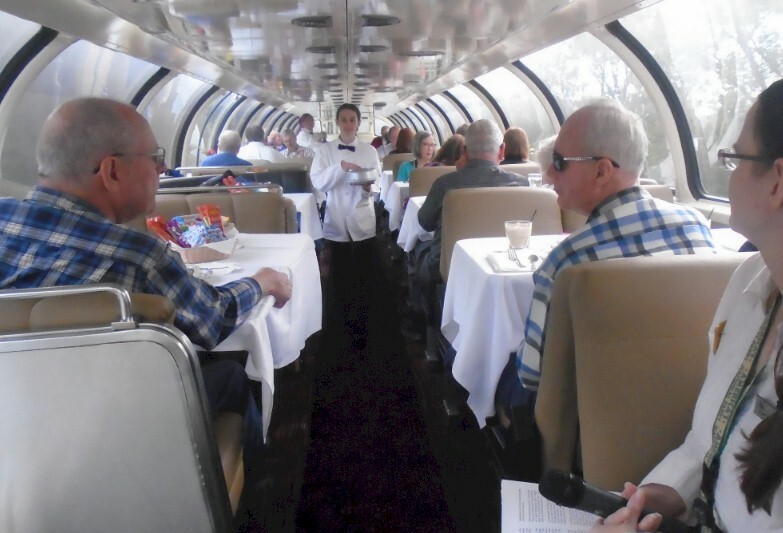 Abernethy uses the all funds raised from such excursions to continue restoration work on “Silver View”, an ex-CB&Q dome/round-end observation car that he owns and is in the process of restoring at a rail storage facility in Iowa. 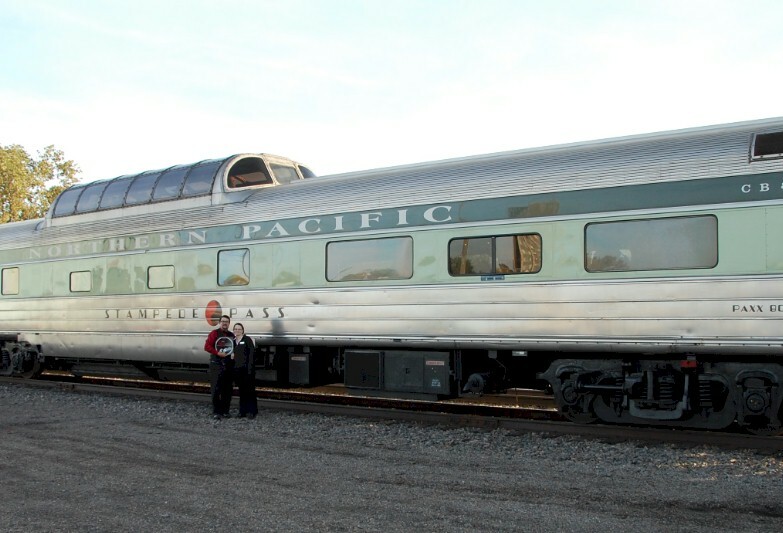 His car, “Silver View”, was built by the Budd Company in 1947 for the Burlington Vista Dome Twin Cities Zephyr. It provided first class parlor service, and was the signature car of one of the most handsome trains ever built. Once Abernethy completes the “Silver View”, he plans to offer excursions on his car, instead of having to contract out trips with other car owners. The APRHF Rail Rangers look forward to being a fixture on his trips, providing passengers with the First Class service they expect. Profits from "Zephyr Route" trips go toward the continued restoration of CB&Q "Silver View"
As part of the 2015 Fall Colors “Zephyr Route” Trip, passengers left Chicago Union Station at 2:15pm on Friday, October 2nd, and headed up to the Twin Cities on a full-length dome car that was positioned on the back of the westbound Empire Builder, Amtrak Train #7. Passengers had the entire day on Saturday, October 3rd, to check out whatever sites in the Twin Cities that they wanted to see. Many chose to head over to the Mall of America or walk around the downtown areas of Saint Paul or Minneapolis. One popular location for tourists to visit is Minnehaha Falls, located in Minneapolis. The Milwaukee Road would actually use a glass bottle filled with water from Minnehaha Falls to “christen” new railroad equipment before it was put in service. 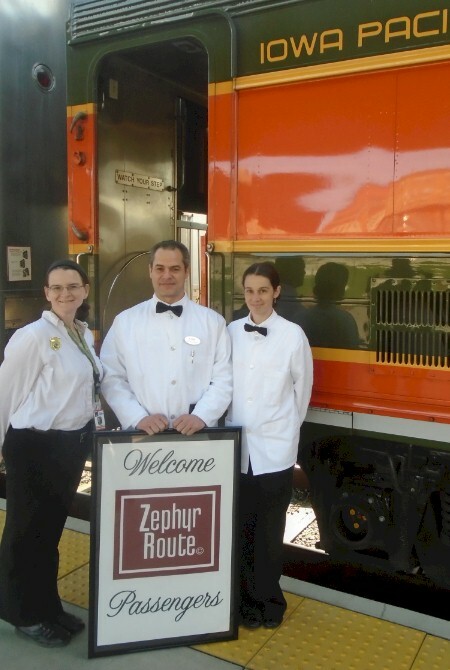 On Sunday, October 4th, 2015, APRHF Rail Rangers joined up with the passengers on the “Zephyr Route” excursion and provided an interpretive program for 400 miles of the route between St. Paul Union Depot and suburban Glenview, Illinois. The weather was perfect and the skies were clear and blue, providing everyone beautiful views of the Mississippi River, rolling hills of Western Wisconsin, the Wisconsin Dells, and the urban corridor between Milwaukee and Chicago. Despite being a few hours late due to a late departure of the Empire Builder from its origin in Seattle, passengers had an excellent ride, combined with excellent food and conversation. Passengers got to listen to the route highlights provided by the APRHF Rail Rangers and had the chance to purchase route guide books that explained the route highlights in more detail than what was shared over the wireless speaker system. 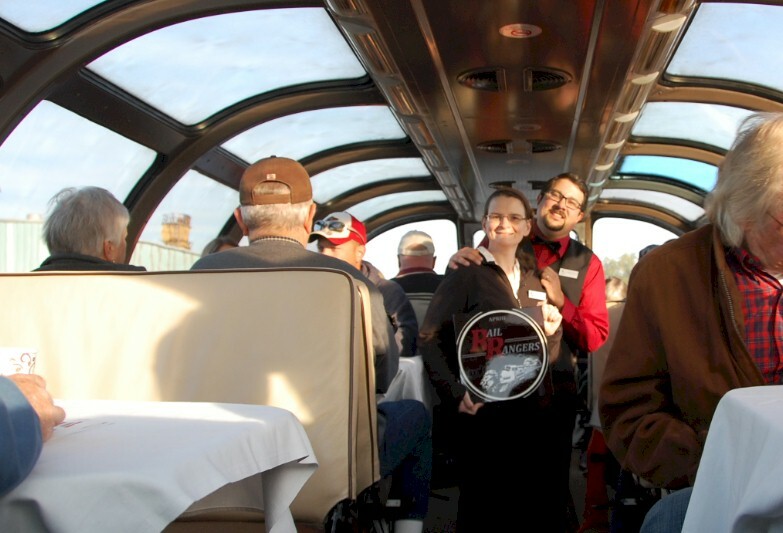 The “Zephyr Route” trip took place using “Prairie View”, an ex-Great Northern Dome Car that is currently owned and operated by Iowa Pacific Holdings. The car was built in 1955 as #1394, and was used on the Empire Builder between Chicago and the Pacific Northwest. It was acquired by Amtrak when it took over passenger operations and ran on various routes as Car #9364. 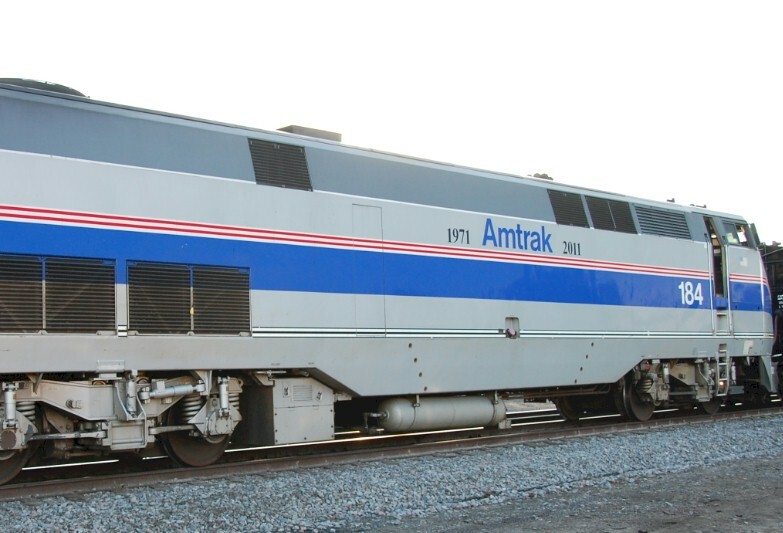 As Superliner equipment became more popular in the early 1980’s, the dome was used as a parts car by Amtrak. By May 1993, it was sold as a shell (less trucks) to the Burlington Northern. It was stored by the BN at a shop in Springfield, Missouri for about a year before being sold to Holland America Westours. After putting over $1,000,000 of work into the car, it was re-named “Deshka” and put into service on the Alaska Railroad line in 1997. In 2003, Westours put all three of their Budd domes up for sale; they kept this car because it required no couple pocket modifications for the new Colorado Railcar domes and it has Budd braked trucks (from under one of the two 1956 Budd built Santa Fe business cars that were re-trucked with four wheel trucks in 1989). 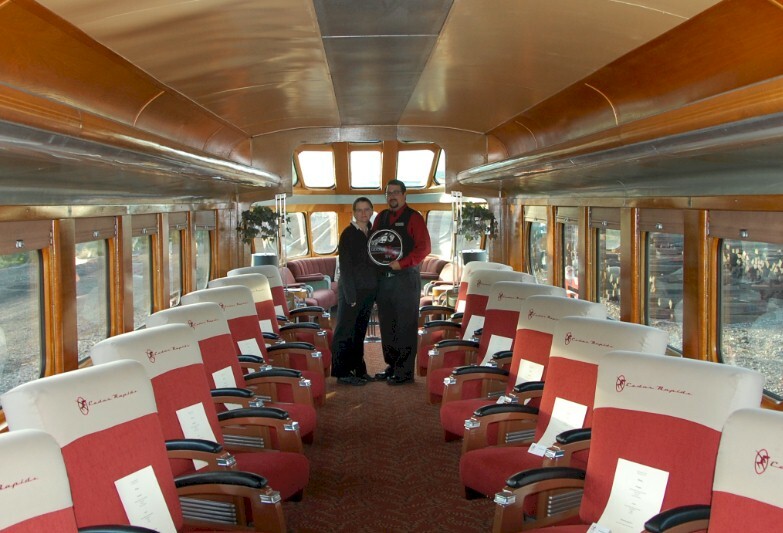 The car was transferred in late 2004 to a new division called “Alaska Rail Tours” (which is now out of business). In October 2009, it was sold to the Iowa Pacific and renamed back to the original “Prairie View”; it is used in various charters across the country. “Prairie View” was one of five Great Domes constructed for the Great Northern. 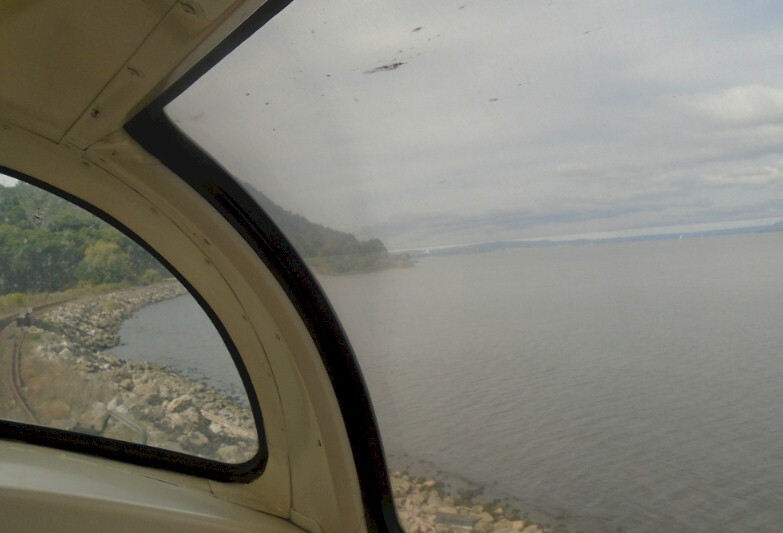 It is the sister-dome of “Ocean View”, the last remaining dome car in Amtrak service; it has been used in New York and around the Midwest during the fall season over the past couple of years. 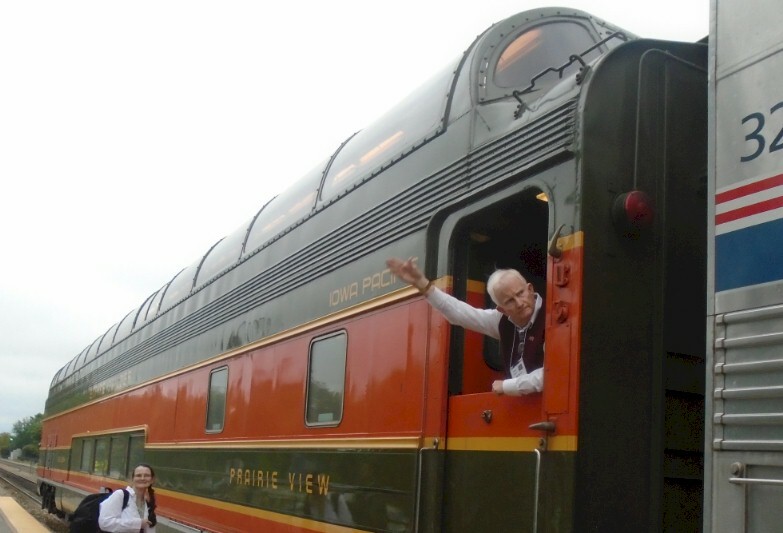 There was really no rest for the weary as APRHF Rail Rangers volunteers headed back up to the Twin Cities the following weekend for a special steam excursion train that was organized by the “Friends of the 261”. The “Friends of the 261” is also one of the original groups that agreed to partner with the APRHF Rail Rangers when the group was organized earlier this year. The trip that was held on Saturday, October 10th, and ran for more than 100 miles between Minneapolis Junction, Minnesota and Boylston, Wisconsin on the ex-Great Northern Hinckley Subdivision. The focal point of the trip, was of course, Milwaukee Road Steam Locomotive #261. It was built by the American Locomotive Company (ALCO) in Schenectady, New York in June 1944 in the 4-8-4 configuration. It was originally operated by the Milwaukee Road when that rail company was officially known as the Chicago, Milwaukee, St. Paul & Pacific. The locomotive, which weighs in at 460,000 pounds, is rated at a maximum horsepower of 4500 and maximum speed of 100 mph, is coal fueled. It operated on the Milwaukee Road until retired in 1954, and was donated to the National Railroad Museum in Green Bay. In 1991, the newly formed "North Star Rail" selected 261 for restoration for mainline excursions. The 261 was moved from Green Bay to Minneapolis to the GE shops at Humboldt Yard in September 1992. There, a full-time staff rebuilt the engine. 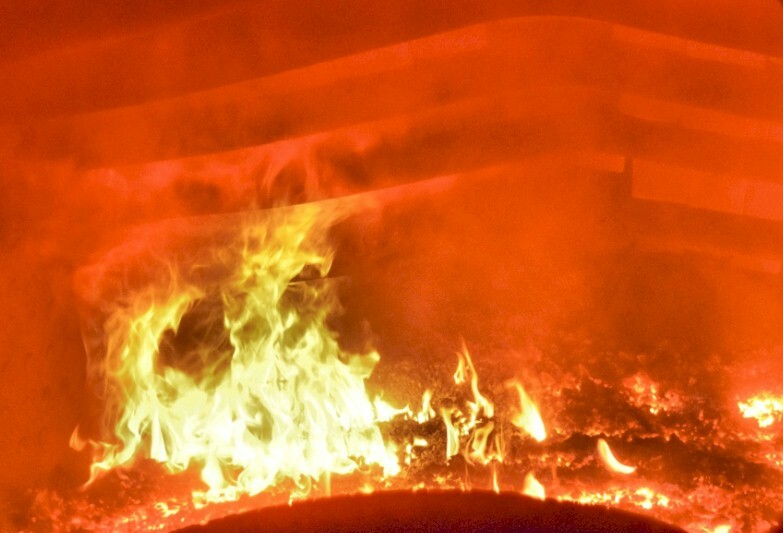 Work progressed quickly, allowing for a hydrostatic test in June 1993, a test fire up in July, and the eventual restoration completion in September. After passing the FRA inspection on September 14, the engine deadheaded over Wisconsin Central in time for its first public excursions on September 18–19, 1993. The engine later returned to its new home at the leased Burlington Northern Minneapolis Junction. Between 1993 and 2008, the 261 went on various excursions across the Midwest and the country. In May 2008, the engine was deadheaded to Chicago for filming in "Public Enemies", a movie based on the life of John Dillinger and starring Johnny Depp and Christian Bale. Though the 261 was built ten years after Dillinger died, the engine did fit the bill for a steam engine that could be filmed at Chicago Union Station. The engine's final excursion before the required Federal Railway Administration's "15 year inspection" for the 261 was a run in September 2008 on Canadian Pacific's ex-Milwaukee Road line from Minneapolis to Winona with a return on BNSF's ex-Burlington line from La Crosse to Minneapolis. 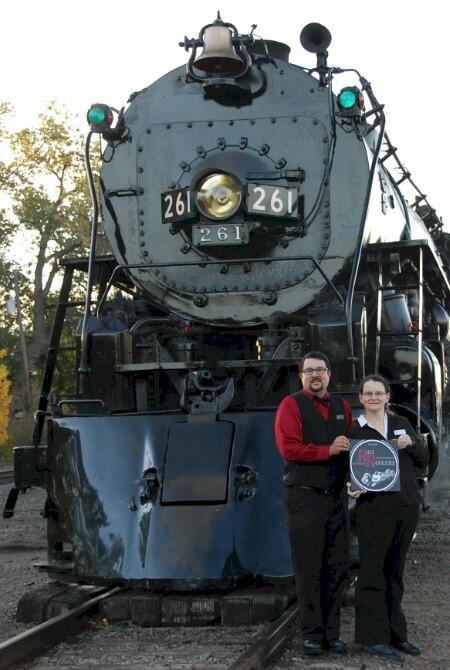 The Friends of the 261 finally were able to purchase the locomotive in May, 2010 for $225,000, keeping it in Minneapolis and returning it to operation upon its rebuild. On September 29, 2012, 261 was test fired and ran under her own power once again. In May 2013, 261 ran on an overnight round trip to Duluth, where she met Soo Line 2719 for the first time. 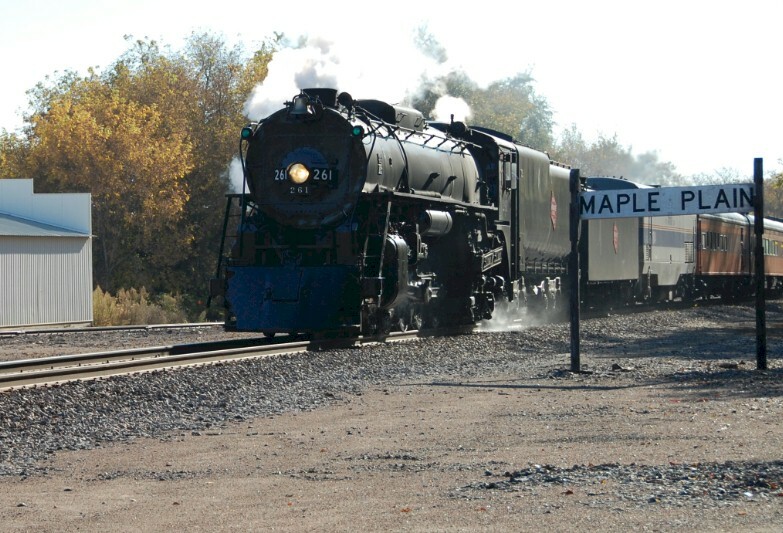 October 2013 marked the 261’s return to Fall Color Excursion service. Travelers who rode on the excursion train between Minneapolis Junction and Boylston had their choice between Coach, First Class, and Premium Class. Premium Class on this trip featured the “Friends of the 261” Milwaukee Road heritage cars “Cedar Rapids” and “Super Dome #53”. APRHF Rail Rangers Asst. 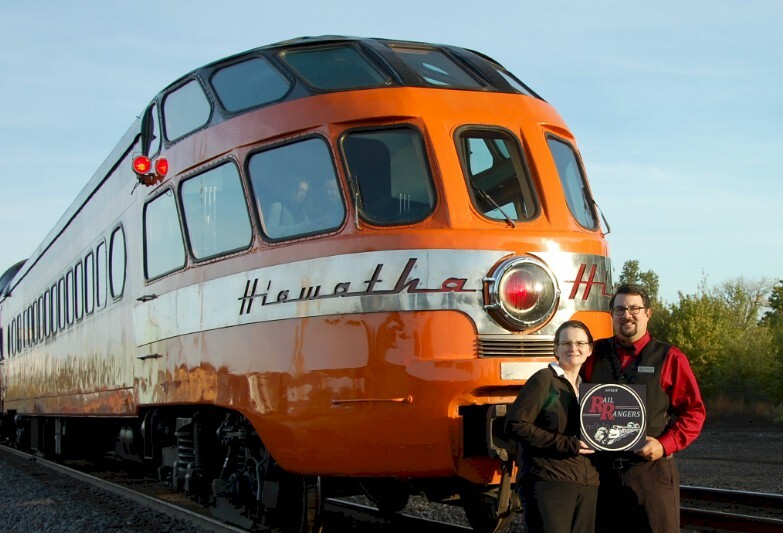 Chicago Coordinator Kandace Tabern (left) and Executive Director (right) with the Milwaukee Road Skytop "Cedar Rapids"
From 1935 on, the name Hiawatha symbolized the fastest and best the Milwaukee Road had to offer. As the original Chicago-Minneapolis trains grew in popularity, Milwaukee Road built all-new Hiawatha streamliners to serve Midwestern and Pacific NW destinations. One of the additions was Skytop Lounges, including “Cedar Rapids”. 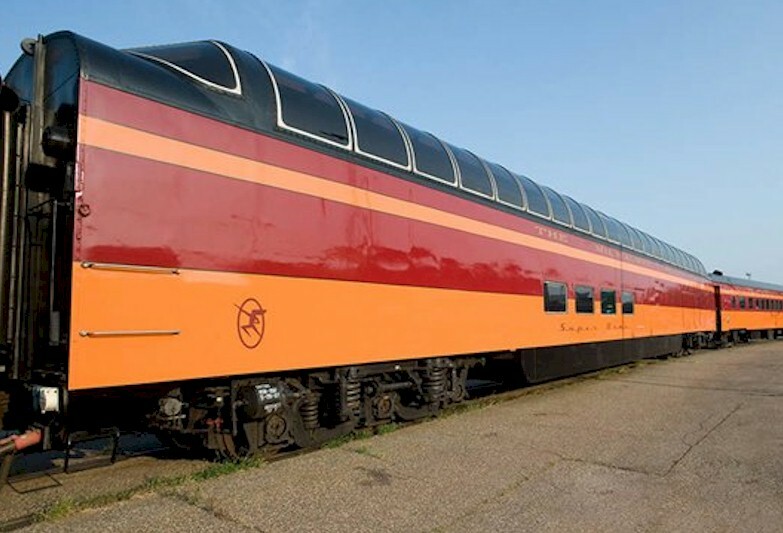 Designed by famed industrial designer Brook Stevens, “Cedar Rapids”, and the nine other Skytop Lounges were built by the Milwaukee Road in 1948 at their Milwaukee shops. Between 1948 and 1970, the “Cedar Rapids” saw service on the Twin Cities Hiawatha trains which ran between Minneapolis and Chicago. Many consider the Skytops to be the most distinctive cars ever built. Milwaukee Road built the 4 parlor cars in their own shops (1 drawing room and 24 parlor seats) and had Pullman Standard build 6 sleepers, each with 8 bedrooms and a lounge. The observation ends on the Milwaukee built cars are more of a bullet than the Pullman built cars, with the rear couch about 4 inches narrower. The “Cedar Rapids” was retired in 1970. It was rebuilt in 1984 and operated until 1990 as a private passenger car. The car was acquired by the "Friends of the 261" in 1998 and started service behind the Milwaukee Road 261 in spring of 1999. It was upgraded and returned to Amtrak service in 2004 by the crew of the 261. The "Cedar Rapids" today has 24 rotating reclining chairs in the main section and seating for an additional 12 in the solarium. It had spent much of late 2014 and early 2015 undergoing further renovations that put new covering on the seats and new carpeting on the floor of the car. APRHF Rail Ranger volunteers were stationed in the Super Dome car and provided narration and commentary for passengers on Saturday morning’s northbound trip. There were 10 “Super Dome” cars built in 1952; they were the first of the “full domes” and originally seated 68 passengers upstairs and 28 in a cafe downstairs. Railfans will note that the Super Domes were the first of the Pullman-Standard domes with curved glass. Between 1952 and 1961, the Milwaukee Road assigned six of these cars to the Olympian Hiawatha, which ran between Chicago and the West Coast. Between 1961 and 1964, these cars ran on “City” trains in conjunction with the Union Pacific; others saw service on Chicago-Madison, WI short hauls. The other 4 Super Domes were assigned to the morning and afternoon Hiawathas which ran between Chicago and the Twin Cities. As more and more people chose to drive or fly in the 1960’s, railroads looked at cutting trains and their reducing their fleet. Even though dome cars provide the best views for passengers, they were very expensive to operate and maintain. The Super Dome you are traveling in today requires 16 tons of air conditioning to keep passengers cool. In 1965, the Milwaukee Road sold the dome car you are riding in today to the Canadian National, which named it “Athabasca”. This car saw service in Canada on the CN and later VIA until it was retired in 1982. In the early 1980’s, this car was brought back to the U.S. and refurbished under a few private owners; it was once again based in Milwaukee. It was sold to the Chicago & Northwestern Railroad in 1985 and was used as a business car. In 1995, the C&NW was bought by Union Pacific who didn’t really want the Super Dome anymore. The following year, it was bought by the North Carolina Department of Transportation and was used as a lounge car on Amtrak’s “Piedmont” service. In January 2005, the Friends of the 261 purchased the car off eBay and moved in to the Twin Cities to begin service on its trains. 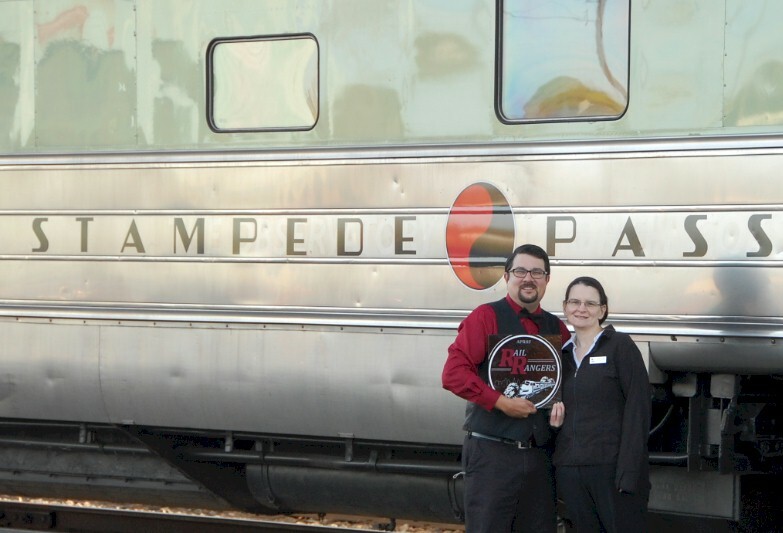 Various photos of the APRHF Rail Rangers team on ex-Northern Pacific private car "Stampede Pass"
A special private rail car that operated on the October 10th excursion train was dome car “Stampede Pass”; it was purchased in January 2015 by Paxrail, an organization owned and operated by James and Kim Evenson of Glenview, Illinois. 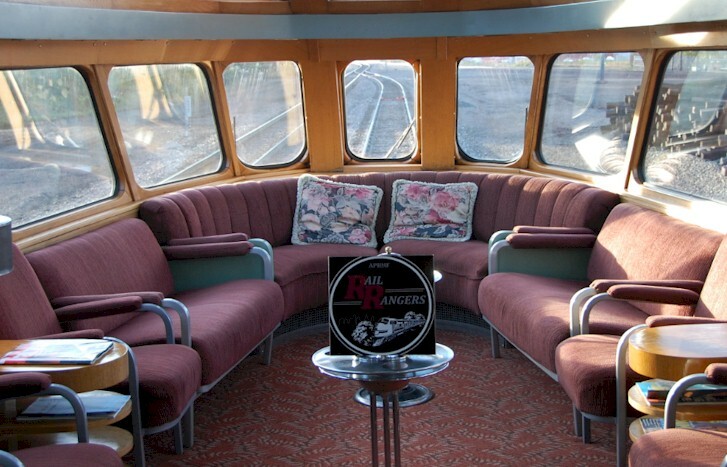 This dome-sleeper-lounge was built as a dome-coach in 1954 for the Northern Pacific Railway, and operated on their flagship train, the North Coast Limited between Chicago and Seattle, Washington. Today the car has three deluxe bedrooms, a kitchen, lounge space, and dome seating. Paxrail plans to make the car available for charters out of Chicago for groups, after it undergoes a major refurbishment over the next few months. Passengers in the “Stampede Pass” also got to interact with APRHF Rail Rangers volunteers who roved throughout the whole train in order to answer questions about the rare-mileage route. Another interesting part of the October 10th excursion train was Amtrak Locomotive #184.Even though the Milwaukee Road steam locomotive does most of the pulling, an Amtrak engine is added in the consist in order to provide extra head-end power to all of the private cars on the train. Amtrak #184 was one of the six locomotives that received a special paint job for the railroad’s 40th Anniversary celebrations in 2011. It was painted in grey to reflect the “Phase IV” paint job that was common for Amtrak locomotives during the 1990’s. This engine debuted on April 13, 2011 and has been seen on various routes all across the country. It was nice that Amtrak would provide this special engine for the “Friends of the 261” trip; previous excursions have seen the Phase I (Engine #156) and Phase II (Engine #66) added to the consists. 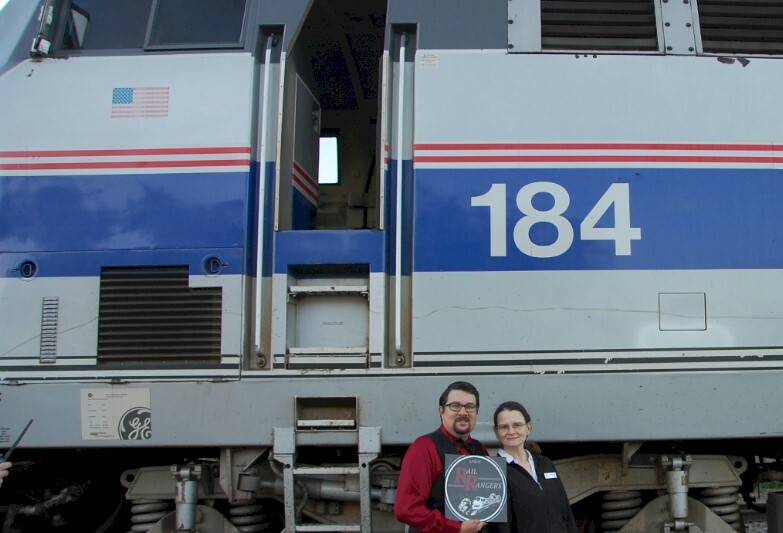 If you missed your opportunity to participate in one of these two exciting excursions that featured APRHF Rail Rangers volunteers, you still have several chances to interact with the group. On Saturday, November 7th, 2015, APRHF Rail Ranger volunteers will be doing an off-the-train outreach event at the Galesburg, Illinois Public Library at 1:30PM CT. This event is free and open to the public and will feature a 60-90 minute Power Point Presentation about the APRHF and APRHF Rail Rangers, as well as some of the interesting landmarks that you can see on the train between Chicago, Galesburg, and La Plata, Missouri. The following weekend, on Saturday, November 14th, 2015 and Sunday, November 15th, 2015, APRHF Rail Rangers volunteers will be staffing a booth at TrainFest 2015 in Milwaukee, Wisconsin. Make sure you stop by between 9:00am and 5:00pm and meet some of the people on the Rail Rangers team and buy some of the Outside the Rails Route Guides which will be on sale. The APRHF Rail Rangers’ final event of the year will take place with the “Friends of the 261” at Saint Paul Union Depot on Saturday, December 12th, 2015. 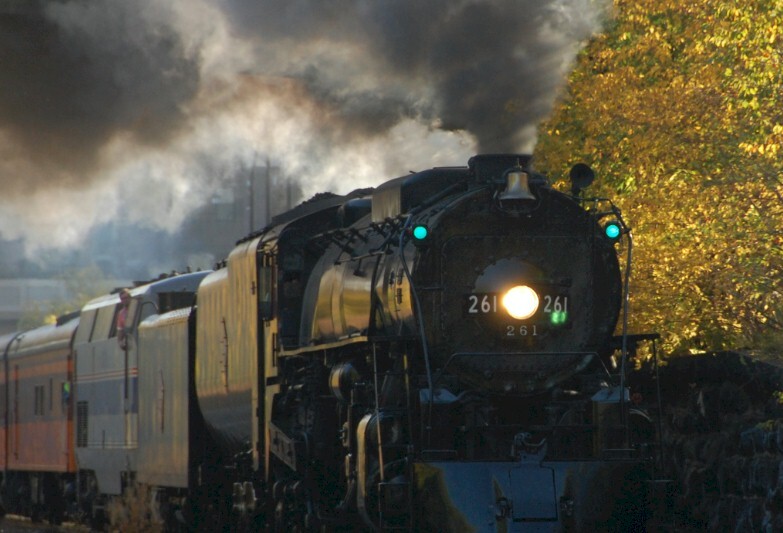 Volunteers will be on-hand selling children’s activity books and staffing their steam-powered “North Pole Express” train; there will be multiple departures with times listed and tickets being sold at www.261.com. Believe it or not, work is already underway when it comes to planning for APRHF Rail Rangers’ 2016 activity schedule for both on-board interpretive programs and off-the-train outreach events. 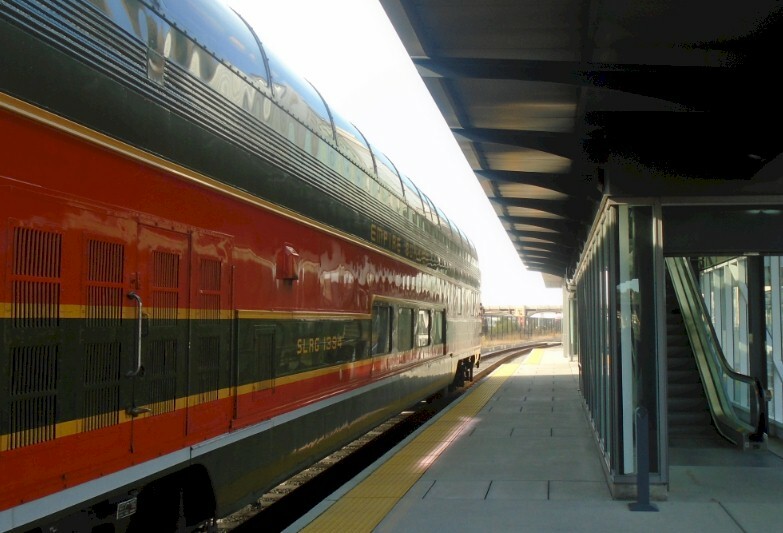 Both “Zephyr Route” and “Friends of the 261” plan to continue working with the American Passenger Rail Heritage Foundation in 2016. Meanwhile, APRHF Rail Rangers has meetings planned with other railcar owners during the “off season” to possibly add them to the growing list of owners seeking the unique service that APRHF Rail Rangers can provide. 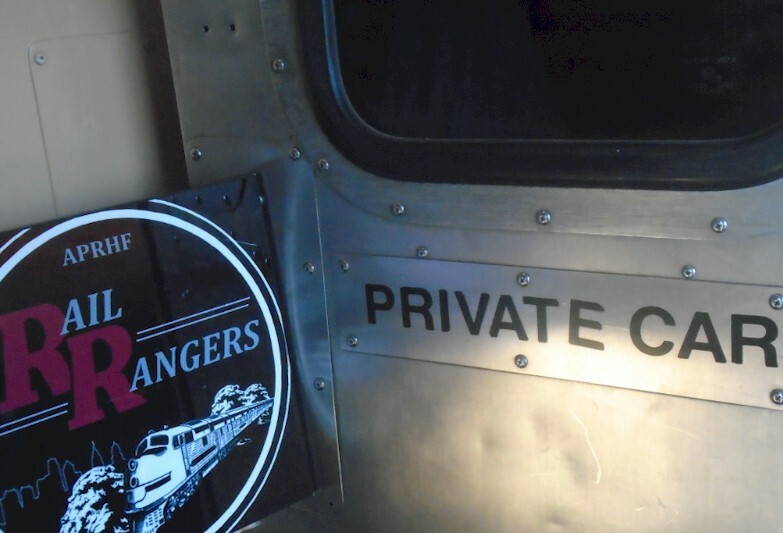 If you are a private railcar owner or know someone who is, and would possibly like a program to be put on for passengers by our group, you can contact Executive Director Robert Tabern at robert@rtabern.com or APRHF President Bob Cox at president@aprhf.org. APRHF Rail Rangers is looking for possibly two more experienced volunteers for its 2016 season; if you or someone you know is interested, they can also be in touch with either Robert Tabern or Bob Cox. The number of trips a volunteer gets will depend on the number of trips scheduled with private car owners.